The text (Vayikra / Leviticus 15) goes on to describe what occurs following one having this uncleanness of a discharge from the body. Whatever he touches becomes unclean (15:7), everything on which he sits becomes unclean (15:4), anyone who touches his bed becomes unclean (15:5), whoever sits on the thing that he sat upon becomes unclean (15:6), if the unclean person spits upon someone else, he becomes unclean (15:8), the text repeats what he sits upon and everything he touches as being unclean and those who touch those things also become unclean (15:9-11). The text goes on to say clay vessels that were touched are to be broken (15:12), and when a person is cleansed from the discharge, he is to wait seven days for his cleansing to be complete, and he is to wash his cloths and body in running water (יִשָּׁטֵף בַּמָּיִם). The text describes the transmittance of uncleanness to objects and to others. In the Talmud Bavli Niddah 54 the rabbis describe the menstruating woman as a more stringent case than what is referred to here in Vayikra / Leviticus 15 on the one with a discharge. In the case of a woman the menstrual blood confers uncleanness when either wet or dry, whereas the one with a discharge confers uncleanness only when wet. Also, a menstruating woman causes impurity as soon as she has spotted blood the first time, whereas the blood of a person afflicted with זיבה transmits impurity only after several sightings or sightings on consecutive days respectively. The rabbis say there is a kol vachomer (קל וחומר) to be learned here. The idea here is that these things refer to the impurity and not the person who becomes impure. The transmittance of impurity is clearly described here in the text, where both the male zav (זב) and the female transmits impurity, the man who sees his discharge, makes the observation over a period of a few days (three) whereas the woman knows the period has begun on the first sign of spots. After the man has observed on the third day that he has a discharge, then uncleanness has been transmitting from since the first day the discharge was observed. 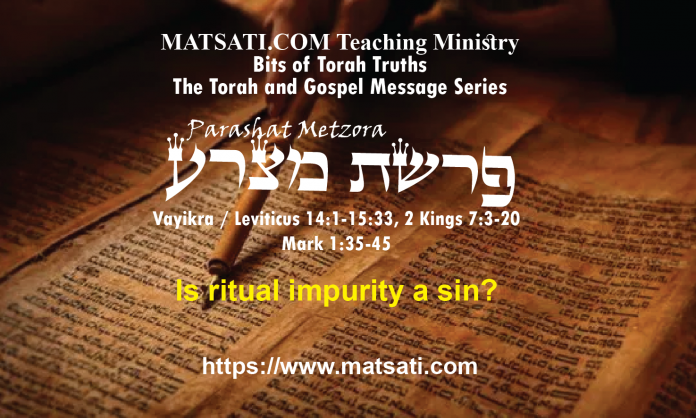 This week we are looking at the Torah text from Vayikra / Leviticus 15:1-15. 14Μὴ γίνεσθε ἑτεροζυγοῦντες ἀπίστοις: τίς γὰρ μετοχὴ δικαιοσύνῃ καὶ ἀνομίᾳ; ἢ τίς κοινωνία φωτὶ πρὸς σκότος; 15τίς δὲ συμφώνησις Χριστοῦ πρὸς Βελιάρ, ἢ τίς μερὶς πιστῷ μετὰ ἀπίστου; 16τίς δὲ συγκατάθεσις ναῷ θεοῦ μετὰ εἰδώλων; ἡμεῖς γὰρ ναὸς θεοῦ ἐσμεν ζῶντος: καθὼς εἶπεν ὁ θεὸς ὅτι Ἐνοικήσω ἐν αὐτοῖς καὶ ἐμπεριπατήσω, καὶ ἔσομαι αὐτῶν θεός, καὶ αὐτοὶ ἔσονταί μου λαός. 17διὸ ἐξέλθατε ἐκ μέσου αὐτῶν καὶ ἀφορίσθητε, λέγει κύριος, καὶ ἀκαθάρτου μὴ ἅπτεσθε: κἀγὼ εἰσδέξομαι ὑμᾶς, 18καὶ ἔσομαι ὑμῖν εἰς πατέρα, καὶ ὑμεῖς ἔσεσθέ μοι εἰς υἱοὺς καὶ θυγατέρας, λέγει κύριος παντοκράτωρ. 1ταύτας οὖν ἔχοντες τὰς ἐπαγγελίας, ἀγαπητοί, καθαρίσωμεν ἑαυτοὺς ἀπὸ παντὸς μολυσμοῦ σαρκὸς καὶ πνεύματος, ἐπιτελοῦντες ἁγιωσύνην ἐν φόβῳ θεοῦ. Paul’s reference to Belial is to the Tanach in the book of Judges 19-21. The concepts that Paul is bringing together here parallels Sodom and Gomorrah and sexual sin, murderous behavior, war, and the lack of the qualities that make us who we are as God’s people being filled with peace, humble, having hospitality, and sexual morality. Paul connects this to our bodies being the Temple of God and then being united with those who are unclean in their sins (unbelievers, sons of Belial). It is interesting what Paul is saying to the Corinthians, he is describing that we are not to be bound together with unbelievers. We who are righteous (the light) have no part with lawlessness (the dark), and that believers have nothing in common with unbelievers. Paul tells the Corinthians to come out from amongst the unbelievers, the lawless, the wicked, and the unrighteous. He is telling them to be holy and separate from the wicked. He then draws in the descriptions of contracting uncleanness from Parashat Metzora by stating “do not touch what is unclean and I will welcome you.” Is Paul saying that if we touch what is unclean God will not accept us? This seems to parallel Parashat Metzora on the transference of uncleanness and not being able to stand before God. The verse of interest is 2 Corinthians 6:17, a word for word translation of the Greek text states καὶ ἀφορίσθητε, λέγει κύριος, καὶ ἀκαθάρτου μὴ ἅπτεσθε: κἀγὼ εἰσδέξομαι ὑμᾶς “and be separated, says the Lord, and the unclean touch not, and I will take you in.” The Hebrew translation says וְטָמֵא אַל־תִּגָּעוּ וַאֲנִי אֲקַבֵּל אֶתְכֶם “and the unclean thing do not touch and I will gather you.” What is interesting is Paul uses the Greek word ἀκαθάρτου (ἀκάθαρτος, not cleansed, unclean, in a ceremonial sense: that which must be abstained from according to the levitical law, in a moral sense: unclean in thought and life.) and the Hebrew word to translate this is טָמֵא (tamei) meaning “ritually not pure, uncleanly, impure, uncleaned; forbidden for eating, untouchable; defiled.” In 2 Corinthians 7:1 Paul tells us to “cleanse” (καθαρίσωμεν) ourselves in a ceremonial sense (καθαρίζω, to make clean, cleanse, from physical stains and dirt, utensils, food, a leper, to cleanse by curing, to remove by cleansing, in a moral sense, to free from defilement of sin and from faults, to purify from wickedness, to free from guilt of sin, to purify, to consecrate by cleansing or purifying, to consecrate, dedicate, to pronounce clean in a levitical sense). Isn’t it interesting the words Paul uses are closely connected to ritual purity which is the Hebrew word that is used in the Hebrew translation of the NT “Tahor” (טהור)? The Apostle Paul also tells us to Sanctify (קדשתנו, kidshanu) ourselves in the fear of God (ביראת אלהים). Was Paul telling us to make ourselves “spiritually clean?” Certainly not! He understood the differences between intrinsic and extrinsic uncleanness according to the Torah. He knew that spiritual cleansing was a work of God which is known in the Torah as the circumcision of the heart and as we have been studying in the book of Vayikra / Leviticus those sins which confer intrinsic impurity. Spiritual cleansing, the circumcision of the heart is a work of God and His Holy Spirit. Paul is saying that we are called to live holy, separate, and sanctified lives. How do we do that? Fortunately for us God’s Word tells us exactly how to do that. Justification is our faith in Yeshua; Sanctification is how we live out our faith. Note how the Lord God Almighty has sanctified us in his Son Yeshua the Messiah. Because of this, we too are to sanctify our lives by living and walking in God’s ways! The way we sanctify ourselves again is by separating ourselves like Paul said in 2 Corinthians 6:17 “Wherefore come out from among them, and be ye separate, saith the Lord, and touch not the unclean thing; and I will receive you…” Paul describes the standard by which God’s people are to live by in his description on inheriting the kingdom of God according to Ephesians 5:5 For this ye know, that no whoremonger, nor unclean person, nor covetous man, who is an idolater, hath any inheritance in the kingdom of Christ and of God. (KJV) Another example may be taken from the dietary commands. Those foods God says are unclean and we are not to eat, and those foods the Lord says are clean and we are to eat. We are given these commands so that we can practice הַבְדָּלָה “separation from the world.” This is the foundation stone of the Torah, and consequentially a fundamental part of our relationship with God and His Messiah in faith, faithfulness, righteousness, and holiness in our day to day lives. These commands that we read in this week’s Torah portion (Parashat Metzora) are not a set of out dated commands that have no application for us today. These commands, just as all of God’s Word, have much to teach us about our relationship with God, with His Messiah (Yeshua), and how we are to live our lives each day. This is how the Torah and the Gospel Message work together to teach us the truth of God!